Semtech Corporation (Nasdaq:SMTC), a leading supplier of analog and mixed-signal semiconductors, today announced the availability of a new, high-performance current sense amplifier that features low power consumption, high accuracy across input voltages and simplified implementation for design engineers. This product extends Semtech’s portfolio of current sense amplifiers with high-performance functionality for a wide range of analog applications. The current sense amplifier’s voltage is flexible—supporting four to 42 volts—optimizing the device for use in a wide range of applications, such as battery chargers, notebook computers, telecommunications equipment, and wireless chargers. It is currently used on Semtech’s wireless charging reference designs. 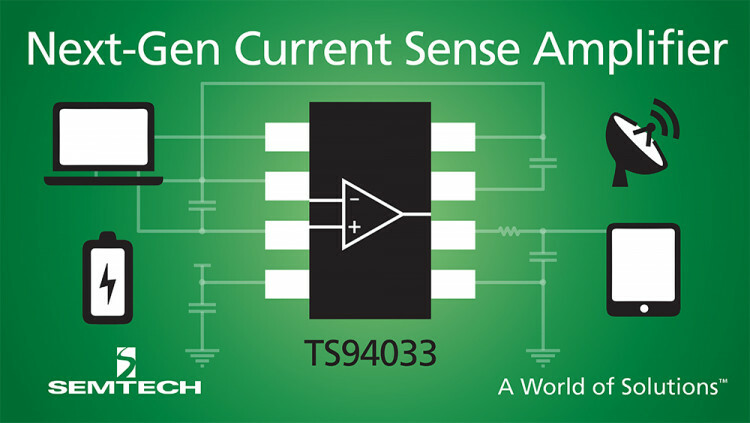 The current sense amplifier is available in an eight-pin, SOT-23 package, and it is lead-free, halogen-free and RoHS/WEEE compliant. Operating quiescent current is below 28µA and standby current is 1.1µA for reduced system power consumption overall. Output-Referred Offset Voltage is as low as 205mV allowing for a smaller sense resistor, reduced energy consumption and high accuracy across input voltages. Chopper-stabilized configuration enables enhanced measurement accuracy and a simplified target application circuit. Flexible supply voltage, from 4V to 42V, supports a wide range of applications. The TS94033 product (order code: TS94033SKTRC) is available immediately in production quantities and is priced at $0.29 USD each in 1,000-piece lots. Semtech offers comprehensive design assistance, including field- and factory-based support. Datasheets, volume pricing, and delivery quotes, as well as evaluation kits and samples, are available at www.semtech.com/info. All statements contained herein that are not statements of historical fact, including statements that use the words “designed to,” or other similar words or expressions, that describe Semtech Corporation’s or its management’s future plans, objectives or goals are “forward-looking statements” and are made pursuant to the Safe-Harbor provisions of the Private Securities Litigation Reform Act of 1995, as amended. Such forward-looking statements involve known and unknown risks, uncertainties and other factors that could cause the actual results of Semtech Corporation to be materially different from the historical results and/or from any future results or outcomes expressed or implied by such forward-looking statements. Such factors are further addressed in Semtech Corporation’s annual and quarterly reports, and in other documents or reports, filed with the Securities and Exchange Commission (www.sec.gov) including, without limitation, information under the captions “Management's Discussion and Analysis of Financial Condition and Results of Operations” and “Risk Factors.” Semtech Corporation assumes no obligation to update any forward-looking statements in order to reflect events or circumstances that may arise after the date of this release, except as required by law. Semtech and the Semtech logo are registered trademarks or service marks of Semtech Corporation and/or its affiliates.